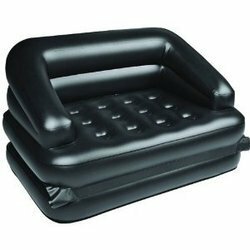 Aimed at acquiring high stage of customer satisfaction, we are involved in offering a highly examined assortment of 5 In 1 Inflatable Double Air Sofa . Our proficient crew of quality inspectors guarantees that these products are in tandem with the set standards of quality and made using premium quality inputs. Moreover, their wide usage in numerous applications makes these highly recommended. Incorporated in the year 2005, Ampalrs Marketing is one of the noteworthy companies engaged in trading and supplying a broad variety of Air Sofa and Colored Air Sofa. Made-up using optimal quality factory material under the command of trained personnel at the end of our vendors; these are enormously commended. Additionally, these are obtainable in multiple provisions and altered forms with us so as to accomplish immense level of patron satisfaction. Appreciated extensively for their rust resistance, seamless finish and robustness, our presented collection of products can be purchased from us within the assured frame of time at most economical rates.